In this post I will argue that LVI's Dr. Bill Dickerson, DDS, is wrong that surgery for the treatment of headaches is never necessary. I coined "the Forest Fire Analogy" of headaches to help show that in cases like mine AGGA treatment is necessary but not sufficient for curing chronic migraines. Migraine nerve decompression surgery must be pursued in parallel to AGGA treatment if a 95% cure is to be achieved. Click here to skip ahead to a nutshell summary of the entire article. Dr. Steve Galella’s Facial Beauty Institute and Dr. Bill Dickerson’s Las Vegas Institute (LVI). Elsewhere on this site I have referred readers interested in AGGA treatment to LVI’s website and dentists. I have done so particularly because readers have asked me where they can find an AGGA practitioner and while LVI makes it easy to find their AGGA-providing dentists The Facial Beauty Institute does not. 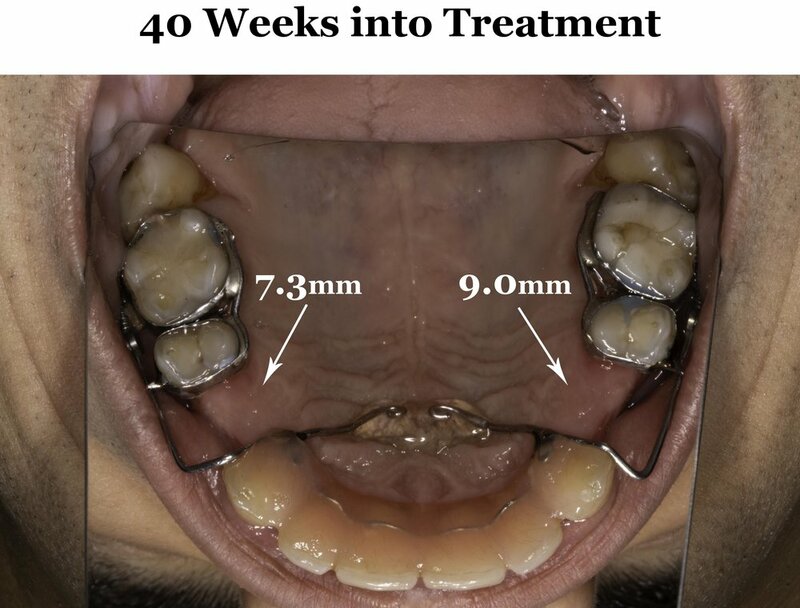 But just because I am (so far) a proponent of AGGA, and just because I refer readers to LVI dentists for AGGA treatment, it doesn’t mean that I agree with everything that comes out of the Las Vegas Institute. In particular, I disagree strongly with a view held by LVI's Dr. Bill Dickerson regarding the role of migraine surgery in headache treatment. Dickerson moderates a Facebook group where readers can ask questions about LVI and its so-called "physiologic" treatments. My website, apparently being one of the world's primary sources of AGGA information, has gotten some attention in that group and a few weeks back I was asked there about my headache surgery. I don’t remember exactly what I said but the gist of my response was that headache surgery with Dr. Ziv Peled had been a huge success for me and I was thrilled with my results. I literally started this website to let the world know about the miraculous relief migraine surgery with Dr. Peled provided me with. I went from disabled to an 85% reduction in symptoms overnight. Dickerson deleted my comment a few minutes later (otherwise I would relate the exchange exactly as it occurred). Upon deleting my comment Dickerson immediately responded in the thread that my views on headaches and headache surgery were wrong, dangerous and not to be expressed in his Facebook group. “I don't want others thinking they need surgery to fix their headaches...they don't,” he declared. “Migraines along with most headaches are muscular." He continued that if I had been treated “physiologically” by an LVI dentist then my headaches would have been cured and I would never have needed surgery. I replied that I disagreed but would not use his Facebook group to argue this point any further. In keeping with my word I will argue my case here instead. Before we can understand why migraine surgery in addition to AGGA was necessary for curing my headaches we must come to a deeper understanding of the etiology of the headaches I was experiencing. Etiology comes from the Greek word aitía, "cause" and -logía, "study of." It means "the study of the cause of [an illness]." It can't hurt to know the cause if we are going to engage in a discussion of the cure. What I have discovered is that there were at least 2 causes to my chronic headaches: 1) an immediate cause and 2) a root cause. 1) Immediate cause: my first migraine surgery with Dr. Peled proved that my headaches were caused most directly by compression of peripheral nerves in my head and neck. These compressed nerves were throwing intense pain signals that manifested in the form of severe headaches. Thus surgery (and actually pre-screening too) revealed that my particular condition was actually a case of occipital neuralgia. “Neuralgia” is a fancy medical term for “nerve pain.” It comes from the Greek word neuron “nerve” + algos “pain”. I had compressed nerves in my neck, eyes, temples and forehead that were giving rise to pain signals that I was experiencing as headaches. Peripheral nerve damage was the "immediate cause" of my headaches in the sense that these nerves were actually throwing the pain signals that I was experiencing as headaches. 2) Root cause: But what caused the nerve compression? Asking this question brings us to the root cause of my headaches. I have hypothesized that ultimately what caused the nerve compression was an orthodontic issue: my small maxilla led to airway restriction which led to poor neck posture. Over the course of many years this poor neck posture resulted in direct compression of my occipital nerves and also to neck weakness which resulted in frequent micro-injury and the subsequent buildup of scar tissue around the nerves. Inflammation in the occipital nerves led indirectly to inflammation in several nerves in the eyes, forehead and temples. 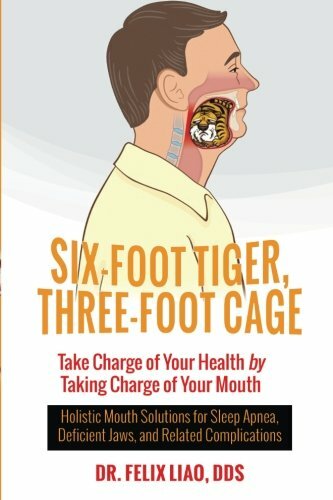 In other words my headaches at their root were a symptom of a six-foot tiger (my tongue) being trapped in a three foot cage (my undersized jaws), as Dr. Liao puts it. Of course, migraine surgery dealt with the immediate cause of my headaches. By mechanically fixing nerve compression using a scalpel and a flesh-burning laser, Dr. Ziv Peled eradicated years of built-up nerve compression in a matter of hours. AGGA orthodontic treatment has addressed the root cause of my headaches. It has remodeled my maxilla forward, opened my airway, and corrected my neck posture according to the Gokhale Method, thus eliminating the underlying cause of my migraines. I think Dr. Dickerson may agree with my analysis of the root cause of my headaches being small jaws forcing my tongue into my airway which results in a compressed neck posture and subsequent damage. If so then he would certainly agree with my proposed treatment for this underlying cause: the Anterior Growth Guidance Appliance (AGGA). AGGA non-surgically remodels the maxilla forward unbelievably fast and far, creating the tongue space necessary to free the airway of obstruction, thus allowing the body to adopt a healthier neck posture. After all, his organization LVI is one of the two major institutes promoting AGGA. So while Dr. Dickerson and I are still in agreement, I want to flesh out the Forest Fire Analogy for headaches and use it drive home the point that AGGA treatment must definitely be part of any thorough treatment of headaches in cases like mine. I want to make it clear that I am not arguing in this post that migraine surgery alone is sufficient for the treatment of chronic migraines in cases like mine. I'm saying it must be a major component of treatment alongside AGGA. The Forest Fire Analogy will bring light to the powerful role that AGGA has played in my achievement of 95% relief from my chronic migraines. Let's now begin to explore how my my occipital neuralgia can be compared to a forest fire. The manner in which my headache pain unfolded is similar to the manner in which a forest fire unfolds: with both headaches and fires, there is 1) an initial spark or trigger and then 2) an ensuing burn which continues long after the initial spark is removed. Every forest fire has distinct ignition spark, such as an untended campfire, a lightning bolt or flicked cigarette. Similarly, my headaches were always sparked. Examples of headache triggers were: a bout of sneezing, an over-confident football toss, a bad meal, a dose of dark chocolate, or, as was most often the case, a strained night’s sleep on my back. Both forest fires and headaches could be sparked by triggers large and small. Some forest fires are caused by a tiny red cigarette cherry. Others are sparked by mighty lightning bolts. Similarly, some of my headache triggers were so subtle I went years without catching on to them, such as headaches being triggered by sitting on a barstool uncomfortably leaned forward for a half hour. Sitting on a barstool? Really? Other triggers were unmistakable, like when my sister’s red nose pit-bull head butted me in the temple. Like a forest fire, my headaches, once ignited, would begin to burn steadily and gradually build up into an all-out inferno. For example I might tweak my neck and immediately feel a 3/10 pain. But rather than dissipating, that pain would cascade into a severe 10/10 episode within hours. Some other types of pain may be triggered by a stimulus and then disappear once the stimulus is removed. Like if you bang your knee or step on a nail, there’s a distinct stimulus and a sudden and intense feeling of pain. That pain peeks instantly and gradually fades with the removal of the stimulus. This is not how my headaches were. My headache pain was like a wild forest fire which, once ignited, grew and intensified and consumed everything in its path, even long after the initial trigger was removed. We have seen how forest fires and headache episodes unfold in a similar manner: ignition followed by ensuing burn. Now we must make sense of the AGGA and migraine surgery treatments according to the terms of the forest fire analogy. 2) reducing forest combustibility - controlled burns of existing forest undergrowth are performed in order to reduce the extent of growth and spread of fires even if spark occurs. AGGA is analogous to (1) eliminating triggers and, as we will see later, migraine surgery is analogous to (2) reducing forest combustibility. AGGA treatment is analogous to (1) eliminating forest fire triggers. Think Smokey the Bear signs everywhere. Campfires are subject to a $1000 fine and smoking is strictly prohibited. 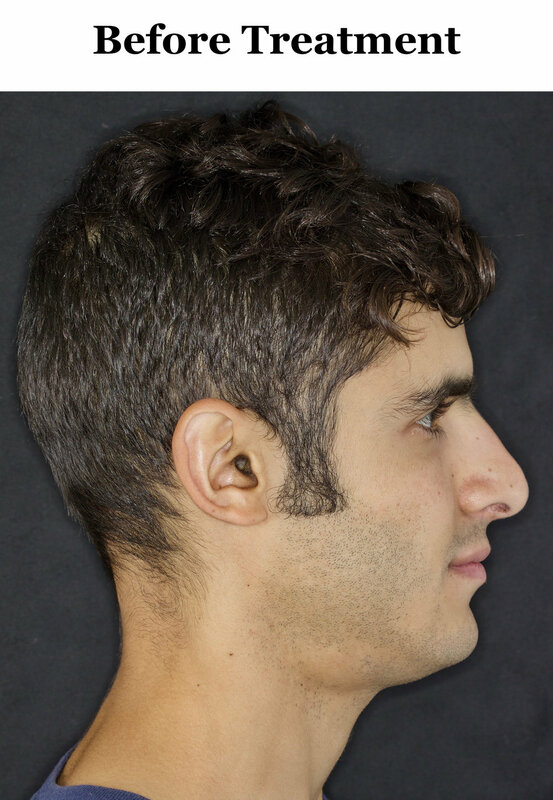 By remodeling the maxilla forward and enabling the development of elongated neck posture, AGGA is removing the root trigger for headaches in cases like mine. With elongated neck posture the neck becomes much less prone to headache-causing incidents of neck strain. The elongated neck is stronger, more rigid and has more integrity than its flimsy, compressed opposite. Neck elongation allows for the strengthening of the neck, so new muscle mass can develop there. This muscle absorbs impacts, shakes, and shoves rather than allowing nerves to absorb the brunt of those blows. Most importantly, AGGA reduces obstructive sleep apnea which I believe was my most common headache trigger. By creating more real estate within the mouth, AGGA makes it possible for the tongue and mandible to come forward and up during sleep. The more that this opening of the airway occurs, the less likely for the body to adopt a strained neck posture for hours during sleep just so the airway can remain open enough for breathing. How do we respond to those who might suggest that migraine surgery alone would have achieved a 95% reduction of my headaches, without AGGA? If migraine surgery occurs, is it still necessary to work hard to eliminate headache triggering events? Absolutely. 1) decompression - If the nerve is salvageable that nerve is “decompressed": that is, it is left intact and simply freed up from surrounding muscle, scar tissue, bone, blood vessels or whatever else might have been impinging on it. My greater occipital nerves, for example, were decompressed. 2) excision - Other nerves, however, are damaged beyond repair. They cannot be decompressed without high risk of continuing to throw excessive pain signals, causing headaches. Such nerves are excised: they are cut upstream of the point of compression and their live end is then buried in a nearby muscle causing the live nerve to go dormant. This is called "neurectomy." All in all, 5 of my nerves were decompressed and 9 of my nerves were cut out. These are the 7 culprit migraine-causing nerves. One of these on each side makes 14 nerves total. 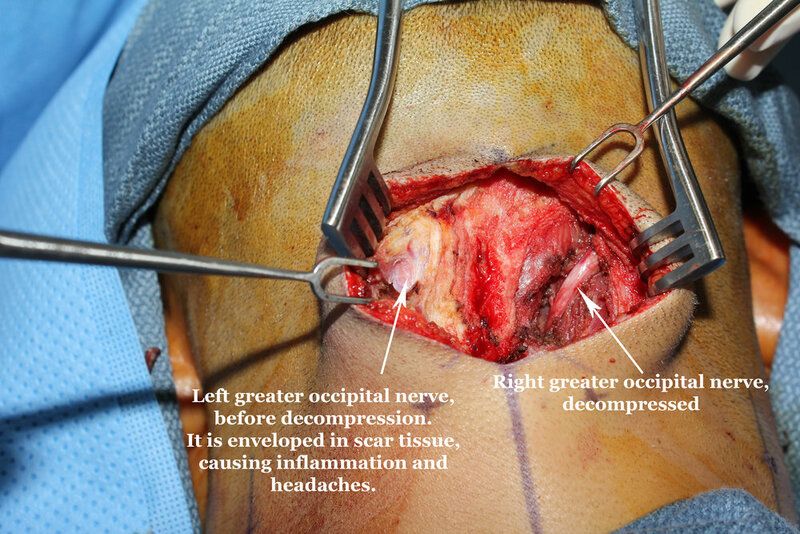 In two separate operations on me, Dr. Peled operated on all 14 of these nerves. Migraine surgery alone is not enough. Correcting neck posture through AGGA treatment is necessary for managing headache pain even after migraine surgery. Nerves that are decompressed and left intact remain in the body near or in the very same position in which they became compressed in the first place. If the underlying cause of compression (poor neck posture) is not eliminated, why wouldn’t these nerves just become compressed again over time? There's a risk that having migraine surgery without addressing the underlying postural problems that led to compression in the first place may allow for recompression to occur in the future. But what about nerves that are excised? One might think that since excised nerves are "removed" that recompression of these nerves cannot occur since there remains nothing left to become compressed. But my experiences suggests otherwise. When neurectomy occurs, the excised nerve is not cut close to the point at which it emerges from the spine. Instead it is cut much further downstream, close to the site of compression. So after a nerve excision, you’ve still got a live nerve end sitting in close proximity to the original point of compression. By definition, this means that the nerve end will be in close proximity to an area that is vulnerable to poor neck posture. As a result the remaining live nerve ends of excised nerves continue to feel pain if you tweak your neck or have a flare up of the frontal nerves that radiates backward. I know, for example, that I feel the live ends of my lesser occipital nerves frequently when I am punching the heavy bag, sprinting or if I sneeze. This means that even after surgery it is important to develop postural habits and strength that can protect these live nerve ends. With poor neck posture micro-injury will continue to occur causing these nerves to become irritated and inflamed. This means continued headache symptoms. I know this is true because I can recreate these symptoms anytime by putting my postural guard down and allowing my neck to be strained. Indeed, usually when I have headaches now it seems to begin in the stubs of my lesser occipital nerves. Prior to surgery my right lesser occipital nerve was my main trigger point. Dr. Peled excised both lesser occipital nerves, pretty much eliminating that trigger point. But the remaining live end of that nerve is definitely not completely out of the picture. The more careful I am with my neck posture, the fewer flare ups that nerve end experiences. Even in the case of a flareup, the pain is nothing like it was before surgery. But caution is still needed. So whether nerves are decompressed or excised, my experience is that they are still vulnerable, albeit much less than before. The more effort ones puts in to adopting postural habits that protect those nerves, the fewer flareups one will have. And since the underlying cause of the postural problems which cause nerve flareups in the first place is an underdeveloped maxilla, the best way to fortify one's neck posture is to grow the maxilla forward using AGGA. AGGA will open the airway and allow the body to begin to adopt a health neck posture. Above I mentioned that in framework of the Forest Fire Analogy, migraine surgery is analogous to reducing the combustibility of the forest through controlled burns of undergrowth. It is "wildfire 101" that forest fires are most severe in forests where a tremendous amount of dry undergrowth has accumulated. This dry brush burns easily providing the fire with plenty of fuel to grow and spread. That's why there's lots of noise being made today about Southern California's epidemic wildfires being caused, counterintuitively, by overprotection of the forests there. By overprotecting the forest, naturally occurring, small fires were not allowed to occur over the past half century. So a tremendous amount of undergrowth has accumulated which makes massive, county-wide fires possible. Using the forest fire analogy, we can think of migraine surgery as a controlled burn of the low, dry forest brush which would cause an initial spark to quickly ignite into a fast-spreading inferno. I stumbled upon this controlled burn in March 2014 during my 550-mile section hike of the Florida National Scenic Trail. Note that controlled burns of forest undergrowth do nothing to reduce the occurrence of fire triggering events – clearing this undergrowth has no impact on whether or not people smoke or build dangerous campfires in the woods. Analogously, migraine surgery has no impact on headache triggering events. Migraine surgery does not encourage better neck posture. That's what AGGA is for. But like a controlled burn of undergrowth, what migraine surgery does do is reduce the combustibility of the head and neck. In other words, mechanically fixing compressed nerves in the head and neck makes it so that headache triggers are less likely to actually ignite headaches, and when those headaches are ignited they are less likely to grow and spread. So before migraine surgery my head and neck were like a forest that had huge amounts of very dry undergrowth. In such a forest, a small ignition source could ignite a huge, state-wide blaze. Turning my face away from my laptop to sneeze at an awkward angle could trigger a 3/10 headache on the right side of my neck that within hours would spread across my neck and forward to my eyes and temples with 10/10 intensity. It would spread down to my gut too causing me to vomit repeatedly even on an empty stomach. All of this from a single sneeze, like a careless camper's cigarette cherry igniting a blaze that burned millions of acres. Migraine surgery clears away all the dead, dry brush low to the ground creating much more open space between the trees and other combustable forest structures. Sure, lightning might still strike and a few trees might catch fire. Or maybe theres a small patch where a fire might rage temporarily before suffocating upon hitting the surrounding clear. But all in all, after surgery the forest of my head and neck requires a much larger stimulus to trigger pain and the ensuing headache blaze burns much cooler and does not spread. Instead of the forest fire being sparked by a cigarette cherry, it now takes a lightning blast to start a fire. And that fire burns out quickly rather than spreading across all of Southern California. Using the Forest Fire Analogy, being treated with AGGA alone would be like taking huge protective measures against triggering forest fires but making no effort to clear the forest floor of dry, highly-combustable branches and brush. The problem with an AGGA-only approach to treatment is that no matter how meticulous one is about eliminating headache-triggering events it is impossible to eliminate them completely. Sure, you can habituate perfect neck posture and use orthodontics to establish perfect occlusion and TMJ alignment. But there's always going to be outlying incidents that break the bank. Physically intense activities in particular will cause postural perfection to be dropped, even if it's just for a moment. But that moment of strain is all it takes. Or there may be that occasional eve when your nose is stuffier than normal, causing a long night of mouth breathing, sleep apnea and strained neck posture. It's no different in the forest. Even if you place Smokey the Bear signs at every campsite and use draconian laws to enforce his mandates, there's nothing Smokey can do to stop lightning storms. Some trigger events are inevitable no matter how perfect your posture and lifestyle are. That's why migraine surgery is needed – because as long as there are huge amounts of undergrowth in the forest of the head and neck, these inevitable triggers will spark hellfire headaches. Consider these photos from my surgery which depict in graphic detail the degree of "forest undergrowth" in my own neck. Could any amount of "physiological treatment" or postural correction have liberated my greater occipital nerves from the clumps of scar tissue that had come to envelop them? Yes, "physiologic" and postural imperfection may have caused the formation of scar tissue. But only a surgeon’s tools could remove it. My nerves had taken so much abuse over the past decade or more that some kind of deliberate clean up was necessary. And what would Dr. Dickerson have to say about my genetically abnormal lesser occipital nerves, which contained 3 and 4 branches instead of the normal 1 branch? In my case all of these extra branches were pinched between the sternocleidomastoid muscle and skin, leading to irritation of the nerve virtually every time I moved my neck. No wonder I had a 10 year headache! Desperate times call for desperate measures. Who else but a surgeon could have fixed my genetically abnormal lesser occipital nerves? My genetically abnormal lesser occipital nerves are another example of a headache triggering stimulus which would not have been eliminated through AGGA treatment alone. Without migraine surgery my lesser occipital nerves would likely have continued to flare up even with perfect neck posture resulting from "physiologic" treatment. In this post I have shown that LVI's chief Dr. Bill Dickerson is wrong that headache surgery is never needed to treat migraines. I coined "the Forest Fire Analogy" to show that in cases like mine, headache surgery ought to be pursued alongside AGGA treatment if a substantial 95% reduction in migraines is to occur. First I set the stage for the larger discussion by fleshing out the etiology (i.e. causal analysis) of my headaches. 2) a root cause identified as small jaws leading to airway obstruction which in turn led to compressed neck posture as a maladaptive mechanism for re-opening the airway in spite of the tongue obstructing it. I then asked, is it necessary to treat both the immediate and root cause when attempting to cure migraines in cases like mine? Dr. Dickerson and I agree that the root cause absolutely must be dealt with – AGGA treatment, which his institute LVI promotes, must be used to remodel the maxilla forward and enable the establishment of proper neck posture. But what about dealing with nerve compression, the immediate cause of headaches, with migraine surgery? In order to show that migraine surgery was also a necessary treatment for headaches I coined the Forest Fire Analogy. 2) ensuing burn - the fire or headache continues to grow and spread long after the initial spark is removed. I then argued that two important measures taken to defend against wildfires – 1) eliminating fire triggers and 2) reducing forest combustibility – are analogous to AGGA and migraine surgery as measures taken to prevent headaches. AGGA is like (1) eliminating forest fire triggers with laws against campfires and smoking insofar as it helps to correct compressed neck posture, which is the main source of headache-causing triggers. Migraine surgery is like (2) reducing forest combustibility through controlled burns of easily-combustible forest undergrowth insofar as it eliminates existing nerve compression which is responsible for fast spreading, high intensity headaches. Next I argued that migraine surgery alone without AGGA is not sufficient for treating headaches like mine because even after surgery nerves can still be inflamed and triggered when neck strain occurs, albeit to a lesser degree than before. Sure, in the post-migraine surgery "forest," fires are much more difficult to spark and do not grow and spread like before. There's much more clearing between the trees, so fires die out quickly even on the off-chance they ignite. But there are still plenty of trees left and it remains important to impose strict rules on campfires and smoking inside these cleared woods of the post-migraine surgery head and neck. Finally I argued the main point of this post which is that AGGA alone without migraine surgery is also not sufficient to cure migraines like mine. Treating headaches with AGGA alone is analogous to the way in which Americans managed forest fires for the past half century. They obsessed over eliminating fire triggers by putting up lots of Smokey the Bear signs warning people not to smoke or make campfires, but did little to address the existing undergrowth inside the forest. This is the first ever Smokey the Bear ad (1944). Smokey, like Dr. Dickerson, is too focused on triggers and neglects the importance of managing forest undergrowth for the prevention of wildfires. Neglecting the undergrowth meant that when the inevitable lightning bolt spark occurred, a raging, county-wide wildfire would ensue. In cases like mine where there was excessive amounts of accumulation of "forest undergrowth" in the form of huge amounts of nerve compression in the neck, eyes and temples, migraine surgery is absolutely necessary. Without migraine surgery inevitable occurrences of neck strain and other triggers will result in fast-spreading, high intensity headaches. In conclusion, migraine surgery and AGGA treatment should be pursued in parallel if a remarkable 95% or better reduction in headaches is to occur. My case proves that this course of treatment is capable of achieving such miraculous results. Questions? Criticisms? Rebuttals? Post your thoughts in the comments section below!